Like many of my generation Capricorn Research has an ambivalent attitude towards Thomas the Tank Engine. In 1960 at the age of 5 I was in love with him. Forty years later as the parent of a 5 year old those old feelings had turned to exasperation. I have to admit to coming close to dumping all those Thomas books in the bin but just in time J K Rowling arrived on the scene and bedtime stories became a source of wonder again. It’s hard to believe now but in those pre Harry Potter days, the top selling children’s writer was a vicar with a name that surely belonged to a different civilisation never mind age, the Rev Wilbert Audry. But why did his stories become so massive and have such a powerful impact on generations of children ? Well, like most of the articles on this website it was down to Pluto. Awdry had the perfect chart for a writer and storyteller. The Sun and Mercury in Gemini with the Moon in Aquarius in the 3rd house. The Moon’s placing in Aquarius in the 3rd in trine with Mercury shows a natural ability to communicate with many different types of children. Both the Moon and Mercury in sextile to Mars in Aries gave him a simple ability to translate his ideas into action. But why so successful ? Well that Moon was part of a T Square in opposition to Venus in Leo that focused onto an apex Jupiter. And ultimately Awdry’s Sun was conjunct Pluto. Anyone with this aspect will always have a large impact on people around them. This and the apex Jupiter was enough to power Awdry’s stories to the top of the best sellers list. Awdry invented the stories to amuse his son Christopher during a bout of measles in 1943 when Pluto reached his T Square opposite his Moon and square Jupiter. His first book was published in 1945 as Pluto was conjunct his Venus. The books sold well throughout the 1950s and 60s but slowly drifted out of fashion. There is however one thing about people with a Sun / Pluto conjunction, they are extremely good at reinventing themselves. In October 1984, with Pluto now in square to Awdry’s Moon and conjunct Jupiter, ” Thomas and Friends ” made it onto TV, with the voice of Ringo Starr as the narrator. 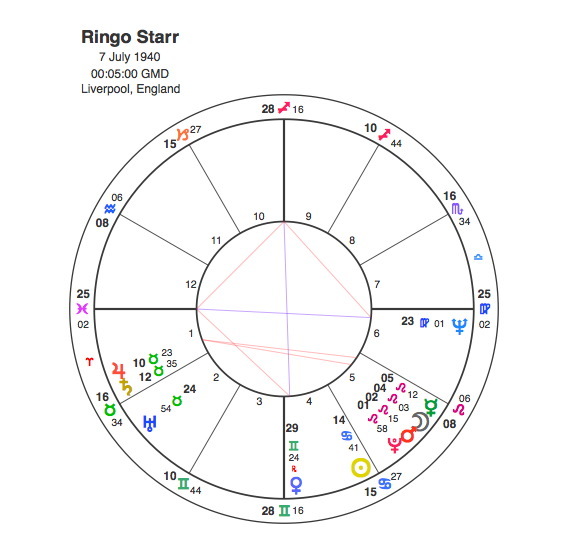 Now of course we all know Ringo from his previous incarnation but the fascinating thing about his chart is that he was probably more suited to playing the Fat Controller on the Isle of Sodor than he was as the drummer for the Beatles. The Sun in Cancer in the 4th house with a stellium in Leo in the 5th seems a natural for childrens’ TV. Ringo’s Moon, Mercury, Mars, Pluto conjunction is exactly opposite Awdry’s Moon and conjunct his Venus. And by the early 1980s Ringo’s star was definitely descending, so his appearance on Thomas and Friends was a reinvention for him as well. As you’d expect because Pluto was transiting square to his Moon, Mercury and Mars in 1984. The TV show was the thing that really catapulted Thomas to stardom and the unlikely Rev. Wilbert Awdry remained at the top of the children’s bestsellers lists until he was finally overtaken by someone else with a 3rd house Moon with an even closer conjunction to Pluto. 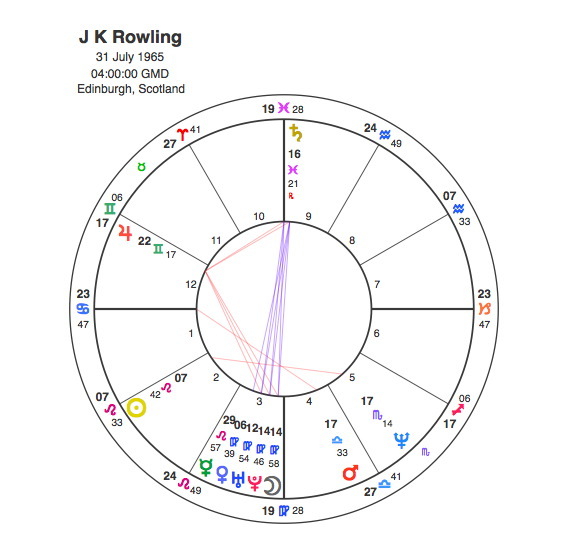 Interestingly though Rowling has the Sun at 7 degrees Leo opposite Awdry’s Moon and exactly conjunct his Venus. Perhaps 7 Leo is a key degree in children’s literature. This is one of the problems with astrology articles, each one suggests more avenues of research. Just so long as I don’t have to read any more Thomas the Tank. If I ever have any grandchildren, I’ll just show them Awdry’s chart and leave the rest to their imagination.